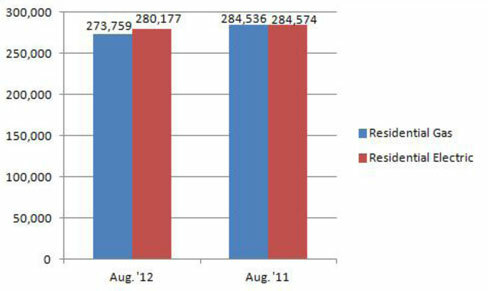 U.S. shipments of residential gas storage water heaters for August 2012 decreased 3.8 percent, to 273,759 units, down from 284,536 units shipped in August 2011. 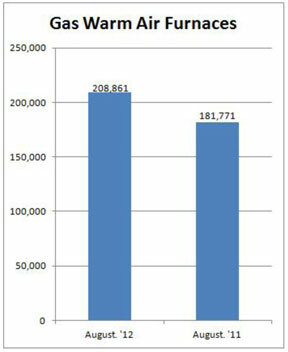 Residential electric storage water heater shipments decreased 1.5 percent in August 2012, to 280,177 units, down from 284,574 units shipped in August 2011. For the year-to-date, U.S. shipments of residential gas storage water heaters decreased .9 percent, to 2,578,638, compared to 2,602,563 units shipped during the same period in 2011. Residential electric storage water heater shipments increased .9 percent year-to-date, to 2,483,428 units, compared to 2,462,055 units shipped during the same period in 2011. Commercial gas storage water heater shipments increased 3.6 percent in August 2012, to 5,968 units, up from 5,760 units shipped in August 2011. Commercial electric storage water heater shipments increased 67 percent in August 2012, to 8,272 units, up from 4,952 units shipped in August 2011. Year-to-date U.S. shipments of commercial gas storage water heaters decreased 2.2 percent, to 53,602 units, compared with 54,805 units shipped during the same period in 2011. Year-to- date commercial electric storage water heater shipments increased 15.3 percent to 46,473 units, up from 40,296 units shipped during the same period in 2011. 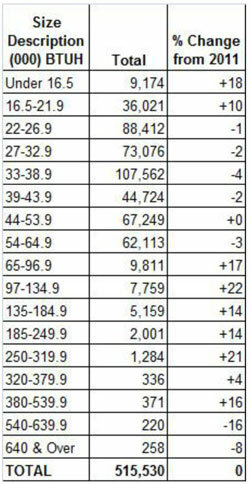 U.S. shipments of gas warm air furnaces for August 2012 increased 14.9 percent, to 208,861 units, up from 181,771 units shipped in August 2011. 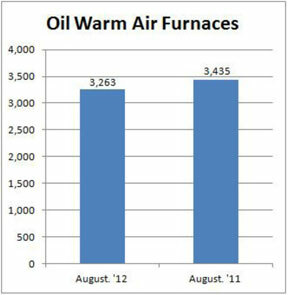 Oil warm air furnace shipments decreased 5.0 percent, to 3,263 units in August 2012, down from 3,435 units shipped in August 2011. Year-to-date U.S. shipments of gas warm air furnaces increased 1.1 percent, to 1,327,733 units, compared with 1,313,610 units shipped during the same period in 2011. Year-to-date U.S. shipments of oil warm air furnaces decreased 30.7 percent to 17,567, compared with 25,352 units shipped during the same period in 2011. U.S. shipments of central air conditioners and air-source heat pumps totaled 515,530 units in August 2012, down .5 percent from 517,864 units shipped in August 2011. 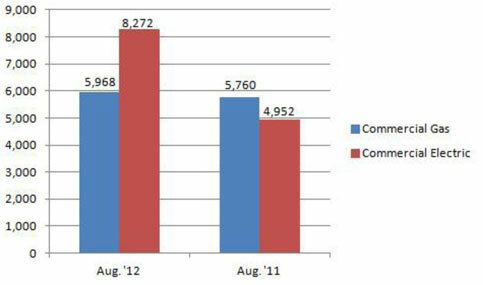 U.S. shipments of air conditioners decreased .7 percent, to 368,650 units, down from 371,157 units shipped in August 2011. 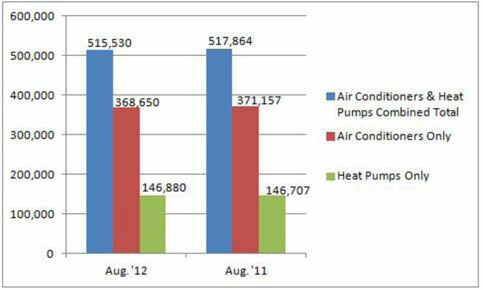 U.S. shipments of air-source heat pumps increased .1 percent, to 146,880 units, up from 146,707 units shipped in August 2011. Year-to-date combined shipments of central air conditioners and air-source heat pumps increased .1 percent, to 4,368,522 units, up from 4,365,417 units shipped in August 2011. Year- to-date shipments of central air conditioners increased 3 percent, to 3,092,220 units, up from 3,003,013 units shipped during the same period in 2011. The year-to-date total for heat pump shipments decreased 6.3 percent, to 1,276,302 units, down from 1,362,404 units shipped during the same period in 2011.